Our approach to analytics is not just to measure after the fact, but to measure everything in real time, which allows you to optimize your communications every step of the way through data-driven strategies. One of the attractions of digital communications is the ability to measure activity through a robust set of metrics based on the tasks that you want people to undertake. We take a dynamic, real-time approach to assessing how well your digital marketing is working and where your time and resources can be best spent. We look at what content drives your audiences to conversions. These data-driven insights fuel continuous learning and enable us to strategically and measurably enhance your communications efforts. In today’s digital age, we are data rich and insights poor. 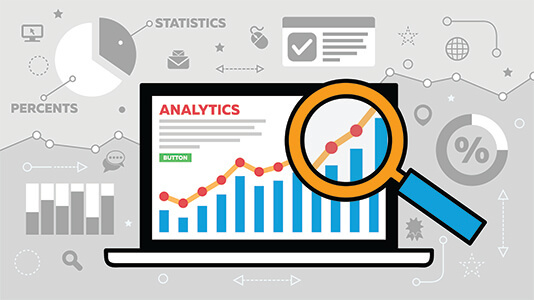 Our analytics programs work to clarify goals and objectives, identify key performance indicators (KPI’s) and apply the appropriate analytics tools. We identify metrics to measure KPI’s and provide reports and analysis with insights for your organization’s communications efforts. Our analysis and reports to you are based on insights that matter relative to your business goals and objectives for your organization. We don’t live in silos. We harness the data to not just report numbers, but to provide key insights on what we are seeing in terms of your goals, what’s working and what may need changing. Our analytics reports are presented in customized formats that are highly visual and contain infographics that are easily translatable across your team.